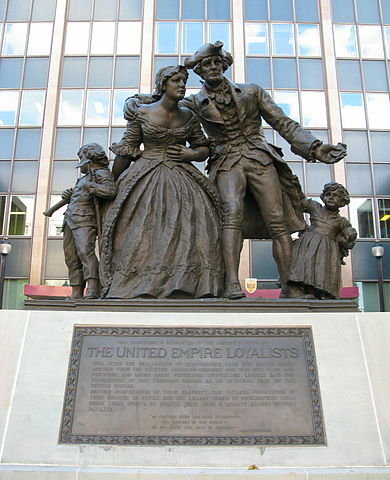 United Empire Loyalist statue and plaque in front of 50 Main Street East, Hamilton, Ontario, Canada. Photo by Saforrest on Wikimedia under CC BY-SA 3.0 license. There are a number of men in the Jeffrey Ferris lineage who chose to remain loyal to England during the American Revolution. The facts are a bit difficult to winkle out because the families were less than pleased and kept some of the particulars from history. The names can be found, but they are so common in the lineage at the time that much more looking has to be done. In addition, the other Ferris lineage also had a few Tories and that creates even more confusion. This one is easy. The hometown folks tarred and feathered him. He actively fought with the British in Butler’s Rangers and he died in Canada. The link has more. Solomon Ferris (1756-1820) – Greenwich, Ct. The good folks of Connecticut were serious about this Tory. He was arrested, sentenced to death for treason, and eventually exchanged for some patriots being held by the British. Looking for more on this chap. I’m hunting for Peter Ferris and Joshua Ferris to nail down their part in the family tree. They are in the UEL paperwork in the Canadian archives but with no other identifying information.